She’s currently worried about a leak in the van she’s driving, and doesn’t know where to look to fix it. 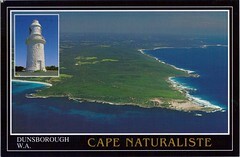 The French Vessel Naturaliste visited this cape in 1801. It was visited earlier by the Dutch vessel Leeuwin in 1627, but there are no records which remain today. La Naturaliste, the ship, under Captain Hamelin was part of a French expedition led by Nicholas Baudin which explored Australian waters around 1801. She was a bomb-corvette which Baudin sent back to France in 1801 with numerous Australian natural specimens. The headland itself is at the western edge of Geographe Bay, in the south-western region of Western Australia. Previous Previous post: Happy 18th Birthday, Sam!